This elfin little creature came into the world quite by accident, when a stray cat gave birth to a curly-haired kitten named Kirlee. Kirlee’s line continued to give us the Devon Rex cat, named after a similarly curly-haired rabbit species. The Devon Rex cat looks straight out of a fairytale, with its tiny cherub face, oversized ears, and mischievous eyes. No, you aren’t walking through a daydream, something this adorable really does exist! The Devon Rex’s small, fine-boned body is coated in its unique curly coat. This coat can be a huge range of colours, including white, black, blue, chocolate, cinnamon, lavender and red; as well as a variety of patterns, including smoke, calico, tabby, tortoiseshell and pointed. The Devon Rex’s curls are open and loose, giving them a rippled look; the Cornish Rex has a more wavy, orderly coat, with tight curls. The Devon Rex has a wide face with a pointed muzzle, while the Cornish Rex has a longer face, with a sloped Roman nose. The Devon Rex’s ears stick out to the side, while the Cornish Rex’s ears stick up. The Devon Rex has a small, stout body, while the Cornish Rex is longer and more slender. Blurring the boundaries even more, many Australian catteries have introduced new breeds into the Rex lines to make them hardier. We can’t be of much help identifying these hybrids, but we promise they’re a bundle of joy no matter what. The Devon Rex cat has a fun-loving personality to match its appearance. A kitten at heart, this breed is a silly, playful little fuzzball interested in absolutely everything, but especially in whatever it is you’re doing. We have some news for Devon ‘owners’: your Devon owns you! Think about it: your cat eats with you, sleeps with you, follows you around, perches on your shoulder, sits at your feet and is constantly in your lap. It even offers you vocal encouragement as you do your chores: that’s a good little human! The Devon is a loving owner, and will give you lots of cuddles to thank you for your service. This cat has a relaxed and friendly attitude that is more dog than cat, so it’s no surprise it will get along great with your favourite canine. And its playful nature is a great match for children. This breed will appreciate having toys to play with and a scratching post is highly recommended, as an alternative to your favourite sofa. As much as it loves attention and play, your cat may get upset being left alone for long periods - if your house spends a lot of time empty, consider filling it with a second kitty, or other friendly animal. The Devon Rex cat is a low maintenance pet. This breed does occasionally have dental problems, and we recommend daily brushing to keep those pearly whites in good order. Their large ears may also need cleaning every couple of weeks. Their fine, curly coat needs no brushing - just running your hand over it should get rid of any loose hairs. And who can say no to pats? However, while we encourage pampering your Devon, be assertive when it comes to feeding time - this cat loves to eat and will happily tuck into any meal you leave unattended. What’s yours is theirs! Just make sure to keep an eye on your cat’s weight: a female should be around 3kg, while a male is generally between 4 and 5kg. Your Devon Rex cat is happy being an indoor cat, but its huge reserves of energy are well spent playing outside. For outdoor play, we recommend buying an outdoor cat enclosure to prevent this delicate kitty from getting himself into trouble with other animals or on the road, as well as to keep native wildlife off the dinner menu! This breed does shed, however their fine, curly hairs are reported to be less of an irritant than regular cat hair. 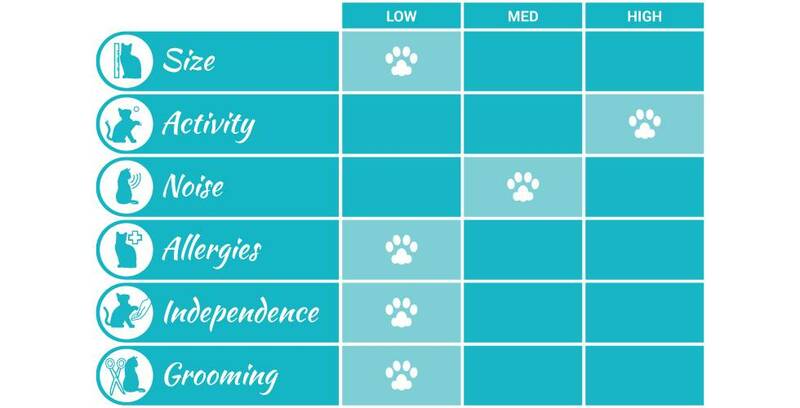 People with minimal allergies might be unaffected, but if just the word feline makes your nose run, consider getting a different breed. If you still need convincing, let us help you fall in love with the Devon Rex; or maybe you want a more independent kitty? It’s okay, we won’t judge. Find the cat that’s right for you here.